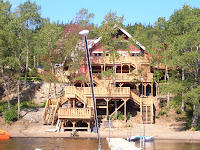 Everything was easy at Gatwick, and we arrive in Deer Lake on time at 6pm, pick up the car from Thrifty - and get going down the Trans Canadian Highway (TCH) heading west towards to Humber Valley Resort. Driving along the TCH with Deer Lake stretching out into the distance on our right, makes a beautiful scene. We briefly stop in Pasadena (a small town to the east of the resort) to pick up some food for breakfast, and then its off to the resort, and it's club house - called Eagles Perch - to check-in. A lovely welcome- and we're met by Jonathan ("hes back! "), who tells us whats happening this week - and makes sure we're all sorted. We drive up to the chalet, and have problems with the driveway steepness. (Daniel says they had similar problems with the snow in April). The front wheel drive rental car only gets half way up, so its down to Daniel to bring the cases up to the chalet. Speaking as his mother, his language wasn't good - but hes excused! Not the arrival Dan & Kate had hoped for, but I get a quick tour round the chalet - wow its amazing, and looks fantastic, and has a view to die for - we then unpack, and get off to the Beach House for supper. Dan & Kate seem to know a lot of the staff, and theres lots of catching up going on. We have a good supper and a few drinks. (The mussels need fine chopped onions and a lot more garlic!) We also meet a new resort senior manager Paul Shelly, who seems very genuine and up for making changes for the good. Seems to be planning an excellent New Years bash. Theres a nice buzz in the place. This is going to be fun! The Newfoundland government says it's "frustrated and displeased" with Air Canada's decision to end its seasonal transatlantic service from the provincial capital of St. John's next year. The province says the announcement means that after the last overseas flight leaves on Sept. 4, transatlantic flights will no longer depart from St. Johns. Astraeus Airlines launched service from St. Johns International Airport to London's Gatwick Airport in May, but the company pulled out of St. John's earlier this month, citing low customer support. Tom Hedderson, the provincial minister of tourism, says Air Canada has had an inconsistent approach to transatlantic service, which is hurting the province. Air Canada ended year-round transatlantic service last September, marking the first time the province was without such service since the Second World War. The Dobbins of Newfoundland are one of Canada's most respected business families. Craig Dobbin built CHC Helicopter Corporation into the largest helicopter company in the world, and today, most Dobbins are involved in family businesses 'off-shore'. But Craig's nephew and former assistant, Brian Dobbin, decided to stay on "The Rock." He's busy transforming Humber Valley Resorts into one of the most successful vacation home communities on the continent. What's more, the parent enterprise of NewFound Resorts Inc., which he heads up, is a public company listed on the London Stock Exchange. Hold on, isn't the middle of Newfoundland one of the bleakest and dreariest places on earth? Who would want to buy a holiday home there ���especially for the winter? Brits, that's who. $280 million worth of them, which is what British vacationers have spent so far in buying homes in the Humber Valley Resort, a quick 5.5 hour flight from London, and one of the lowest-cost options for all-season second homes that modern-day Britons know. The average size of a home is an astounding 4,200 square feet on lots running from 3/4 to 1 1/2 acres. You can play golf on an 18-hole championship course, ski down an Appalachian Mountain, enjoy sweeping lake and forest vistas, spa treatments, luxury dining, and as their brochure says: "It is unimaginable how close this secret paradise is." So, how many Canadians have bought homes in Humber Valley? ... One! How much Canadian money did Brian Dobbin raise to develop an area that 90% of Newfoundlanders haven't been to? ... None! Dobbin is very open and frank on this subject: "Most Canadians think Newfoundland is either rainy or foggy or boggy all year round. They're wrong. But I don't waste my time trying to change their minds. I just go somewhere else where these prejudices aren't as large. We raised our money from Europe and Taiwan, and we raised our customers from Britain." What's the huge appeal to the British that doesn't exist with Canadians? Says Dobbin: "First, the British are incredibly sophisticated when it comes to buying homes abroad. For them, it's no more complicated than for us buying a cottage here. The difference for them is, for $150 a square foot, they can get a small condo in Spain, or they can own a palace in Humber Valley ��� and $150 a square foot is very low in the international vacation property market." Also, "they want pristine wilderness, lots of space and a way to get to it." Dobbin provides that way with direct twice-a-week charter flights 38 weeks a year from London's Gatwick Airport to Deer Lake Airport, a 20-minute drive to Humber Valley. Dobbin is passionate about why the British love Newfoundland. But while he knew from the start who wouldn't want to buy there, he didn't know who would. So he and his colleagues began by hiring some high-end real estate agents in London to help sell the lots and homes that Newfound Resorts was building. It didn't work. So, "we went over to a property exhibition (a trade show where developers show off their properties), put up a booth, played some music, talked our heads off for three days, and came out with 20 sales." Clearly, Dobbins' passion and enthusiasm found a market. Today, there's a secondary market for the original homes sold in Humber Valley, plus a new phase of property for "bespoke architect designed homes." But the next stage of development is vacation rentals, where Newfound Resorts acts as a rental agent to people who want to rent a home for a week or two for their vacation. This, of course, makes the home-owner happy as well; it doesn't take many week's rentals to cover an entire year's mortgage costs. Vacation rentals are growing at the rate of 35% a year according to Dobbin. Some of these renters come from Britain, of course, spurred on by the word-of-mouth from the now 400 Humber Valley home-owners. But Dobbin has his eyes on New York as a major rental market, which is just a two-hour flight to Deer Lake. Hey, this is slightly less than from��� well, another city that's jumping on the Deer Lake bandwagon, and that now has both Air Canada and WestJet flying between: Toronto. A 15-month standoff between the Canadian province of Newfoundland and Labrador and several major oil companies over an offshore oil project ended Wednesday, putting the $5.6 billion development back in motion. Last year, the province’s premier, Danny Williams, walked away from talks with a consortium that includes Exxon Mobil and is led by Chevron Canada after the companies rejected his demands for an equity stake and additional royalties when oil prices are high. On Wednesday Mr. Williams, a Conservative and a multimillionaire, announced that he now had an agreement that would give his province a 4.9 percent stake in the Hebron oil project for 110 million Canadian dollars ($103.8 million). 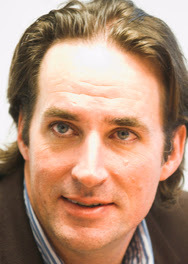 The deal largely fulfills Mr. Williams’s demands from 2006, with the exception of the addition of an oil-processing operation in the province. The Hebron oil field contains an estimated 731 million barrels of oil. Some analysts estimate that construction may begin in 2010. Hebron will be Newfoundland’s fourth offshore oil project. ST. LAWRENCE, N.L. (CP) - Construction has started on Newfoundland's first commercial wind farm, which will feature nine turbines and have the potential to power 6,800 homes. The project in St. Lawrence - located on the Burin Peninsula - is part of a 20-year agreement that Newfoundland and Labrador Hydro signed in January with NeWind, a Canadian subsidiary of Enel North America. A groundbreaking ceremony was held on Thursday, and the 27-megawatt project is expected to be in full operation by the end of 2008. 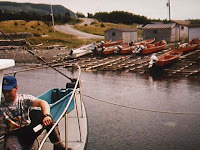 HUMBER VALLEY, Newfoundland — The helicopter moved like a drunk descending a staircase, lurching and rocking while the backwash of its fiberglass blades whipped the tall, pale green grass along Newfoundland’s Main River into a frothy, snapping mass. We landed with a slight bump and four of us clambered out, clutching fly rods and waders, blinking in the bright morning sunlight. In less than four hours via jet and helicopter, we had traveled from the New York megalopolis to the Humber River Valley and a remote pine forest with a slash of black river running through it. The camp, tucked on the downwind side of a swale, featured an ancient, horizontal meat pole fixed to two spruce trees. In a deer camp, you could do chin-ups on the typical meat pole, but this was moose country; the pole was a good 10 feet off the ground. A dented kettle was hung on one of the numerous limbs and stumps that had been hacked and whittled away to create storage options the typical apartment dweller can only dream of. Thousands of air passengers were forced to land in Newfoundland when America closed its air space on 11 September 2001 and they were stranded there for days . They were treated so kindly that some of the passengers have returned and bought summer homes on the rugged island that is the size of California but has only half a million people. The people of Newfoundland are mainly of British origin, with the majority coming from four western counties in England - Devon, Dorset, Somerset, and Cornwall. Perhaps 20% are descended from Irish settlers. In villages along the 10,000 miles of Newfoundland’s sea-sculpted coast, the 17th century accents of West Country people and Irish can still be heard. Outside the modern university capital of St. John’s, the houses so attractive to Americans and expat British are built of two-frame construction, painted in bright colours and scattered in safe harbours near wharves and fish-drying platforms. The British also developed a system which combined light salting for a short period, followed by thorough washing, and drying in the open air. The result was the lightly salted product for which Newfoundland became famous. Everyone used hook and line, an old and environmentally friendly way of fishing. As fishing modernized, demand and greed drove huge foreign catches off the Grand Banks. The foreign fleets were no longer using hook and line. They were making huge kills, including young fish, and they were underreporting catches. As a result the young cod never reached adulthood when, around the age of seven, they spawned. The destruction of the fishing grounds will sound eerily familiar to British fishermen whose livelihood was destroyed by the European Union. Changes in water temperature were also said to be a factor. The extent of the catastrophe was plain in 1990. In a desperate effort to save the industry, Canada shut down fishing. Overnight, 40,000 jobs in Newfoundland were lost. This was a terrible blow. The moratorium was lifted in 1994. There has been a recovery, but the housing market has stayed flat. Newfoundland, after all, is a bit off the beaten track. However, It attracts those who love beauty and the hospitality of Newfoundlanders. They remain welcoming and helpful. For most of their lives they have never locked their doors. In Newfoundland, higher homeownership and construction costs and lower employment growth will dampen housing demand over the next two years. Housingstarts will move lower from 2,234 units in 2006 to 2,100 units in 2007followed by a decrease to 2,025 units in 2008. The average MLS(R) price inNewfoundland will rise by 0.7 per cent and 1.2 per cent in 2007 and 2008,respectively. The Humber Valley Hiking Club is preparing to host a group of more than 30 American hikers this week.The visitors will be coming to the province to especially partake in two particular hikes, namely the Corner Brook Stream Trail network and Western Brook Pond.Both of those trails are the only jaunts in this province currently sanctioned by Volkssport, an international federation of hiking groups. The group is set to arrive Saturday for a six-day adventure are from the organization Walking Adventures International, based in Vancouver, Wash.“This will be the fifth time Walking Adventures has been here, but it will be a different group of people again this time,” said Bob Day of the Humber Valley Hiking Club.Day will lead the hikes through both the Corner Brook Stream Trail and Western Brook. 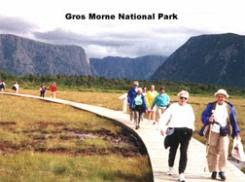 The hikers will keep travelling up the Northern Peninsula, doing the boardwalk hike along Torrent River and visiting the Maritime Archaic Indian national historic site at Port au Choix before making their way to L’Anse aux Meadows to visit the Viking site there. They will then board a charter flight to St. John’s, where they will hike at Cape Spear, Signal Hill, Quidi Vidi Lake and Rennie’s River before heading back home.Last year, a group of about 70 hikers visited western Newfoundland. “The Volkssport-sanctioned trails are what really brings them here,” pointed out Day. “They have their books and they get credit for these two sanctioned hikes. Then they can say they have hiked Newfoundland. Most of them have hiked all the provinces in Canada, all the states in the U.S. and have hiked in Europe too.”Day said he’d love to see more trails in Newfoundland and Labrador get sanctioned.“If we had more Volkssport trails, more people would come just to say they have done them,” he noted. 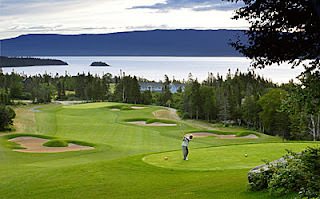 The combined effect of the jet stream providing warm air from continental America and the proximity of the Humber Valley to the ocean ensures the summer season remains very pleasant with an average daily high temperature of 24 degrees Celsius allowing guests maximum enjoyment from the range of world-class outdoor activities on offer. 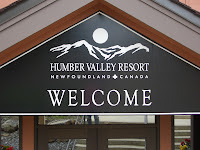 In addition to the full summer programme of on site entertainment and activities for all the family and golf on the renown River Course, Humber Valley Resort has partnered with the best local providers of outdoor experiences producing a variety of things to do and see second to none. The traffic volume for July set a new all-time record for any month in the history of the airport at 35,133 enplaning/deplaning passengers. The previous monthly record was established in August of 2006 at a passenger level of 29,022. Passenger growth at Deer Lake has been strong in each of the past six (6) years and this year is no exception with a year to date increase of 15% recorded to the end of July. Record traffic levels have been posted in each of the past seven (7) consecutive months of this year. Jamie Schwartz, Airport Manager, indicated the airport has reached another milestone in its growth and development. “We were anticipating breaking the 30,000 monthly passenger threshold but we never expected to exceed the previous record by over 6,000 passengers,” said Schwartz. “Our new terminal facilities are certainly helping us manage an average of over 1000 passengers per day in addition to the many people who use the airport’s facilities to meet and greet travelers,” added Schwartz. Parts of Deer Lake on Newfoundland's west coast were flooded Sunday after the town received 31 millimetres of rain in just 20 minutes. Deer Lake received 31 millimetres of rain in just 20 minutes on Sunday, leaving parts of the town under water. 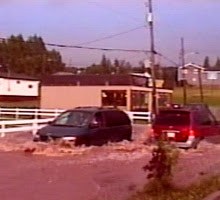 Deer Lake Mayor Darrel Kelly described the conditions in his community as a flash flood. "Water was going across people's property through different parts of the community," Kelly said. "Water went into commercial property, basements. The town had to bring out as many crew as we could, we had to hire additional equipment, we had to do some ditching to try and alleviate the situation as much as possible." 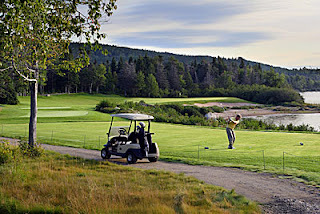 Located in a province few are likely to seek out for golf, Humber Valley’s River Course stands alone as the sole beacon in an area with literally no other even marginal golf courses. Thank God Doug Carrick’s work at Humber Valley is exceptional — otherwise no one would ever talk about this place. 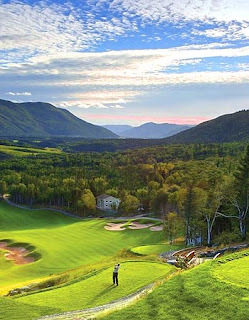 Part of a resort complex built for wealthy Europeans as a four season facility, Humber Valley’s golf course is among the best to open in Canada in a long time. It is better than Fazio’s Coppinwood near Toronto, and better maybe than even Carrick’s Eagles Nest in Maple. It is surely better than any of Carrick or Thomas McBroom’s Muskoka work. Why? Well part of it is an untouched setting that is unlike anything I’ve seen in this country in a long time. Set on a set of steep hills with a surrounding low mountain range, Humber Valley would appear to be a tough site. Most mountain sites are not conducive to golf, with slopes that are too severe and require blasting or significant earth moving. Carrick may have moved a lot of land here — and there are indications he did make cuts, like the clear grade change on the 16th — but largely this is the most natural of Carrick’s courses I’ve seen to date. It all goes downhill from the start — literally. The opener is a par five, and if there’s a weakness on the course, it is the three shot holes. With the exception of the seventh, a tough uphill par five that could be mistaken for the reverse of Highlands Links’ 16th, all are relatively simple holes that play downhill enough to be approached often by a mid-iron. But after the relatively easy opener — which is not a bad thing in itself — Carrick takes the golfer through a series of holes that require thought as opposed to brawn. In fact, driver is not the preferred club in many instances off the tee and the elevation shifts, like the one on mid-length par three second, often leave the golfer deceived when it comes to club selection. It is certainly a course that reveals itself the more one plays. The course has expansive views and the architecture attempts to match the scale. That means prominent bunkers and fairways that offer width without becoming overkill. Greens are relatively subtle, as is the case with most of Carrick’s designs these days, but several offer something unusual for the architect — greens that move from fairway to putting surface naturally on grade. Carrick seems to love his slightly elevated greens — which surely improve drainage — but lose the natural appeal. Several of Humber Valley’s greens have a distinctly natural character, something I’ve rarely seen in Carrick’s work. Keith Collins believes Astraeus Airlines pulled out of St. John's because they were forced out. "They did not abandon this market," said the St. John's International Airport Authority president and CEO. "The market abandoned them." The London, England-based charter airline announced Thursday that, due to low customer demand, it will cease its service between St. John's and London-Gatwick by the end of the summer. The cancellation will have no impact on Astraeus' regular, twice-weekly service to Deer Lake. Flights, which have primarily serviced the Humber Valley Resort's clientele for the past two years, are flying as usual. The news of the airline's discontinuation in St. John's came as a surprise to Collins, who had been prompted by the public to lure a year-round carrier to England. "The market has spoken and we're baffled by it, to be quite honest," he said. "It's a very disappointing development for us and this community. We've lost our year-round partner to London." The service, which began in May, had reinstated the long standing, year-round air link with Europe, which was terminated when Air Canada cancelled its daily flights between St. John's and London's Heathrow Airport last September. The move was an attempt to satisfy Halifax-bound passengers, who were unhappy about having to pass through customs in Newfoundland. St. John's new partnership with Astraeus was pegged by many residents and politicians to be a triumph for business, tourism and travellers in this province. However, the initial interest failed to materialize. Low ticket sales this summer and bookings for the fall meant the company was losing money. Passengers were, instead, "overwhelmingly" choosing to fly Air Canada - by a ratio of 10 to one. Air Canada resumed its direct route to London this year with a seasonal service, running from April to Sept. 4." That means travellers are actually choosing to fly out of Halifax on Air Canada rather than flying direct out of St. John's on Astraeus," Collins said. "That's really baffling because that's exactly why we were asked to find another partner. "Collins figures passengers chose Air Canada because it was familiar, plus the fact they could earn and redeem air-mile points. He also noted that the travel agent industry here has proven to be loyal to Air Canada. He said on average this summer, between five and 30 passengers were flying on Astraeus's 136-seat aircrafts.And the trends for the fall didn't look any rosier. "I'm confident that if they saw the numbers improving in September and October, they would've stayed," Collins said. "It was really quite surprising to them. "The airline had invested heavily in providing the service, in terms of air craft, personnel recruitment, training, marketing and even a new online reservation system. "Astraeus really had no choice, since it were losing significantly on much of their flights," Collins said. "They had to make a business decision. "While the airport will lose money from landing fees, Collins said the biggest loser will be the community, which will not have a direct route to England during the fall and winter months. As a result of Astraeus's pullout, Collins doubts St. John's will find another international airline in the forseeable future to fly to London. "Given what's happened and given the choices the market has made, it's hard for me to credibly present this route as an opportunity for another international carrier, which is really unfortunate," Collins said. "I'll never say never. If market factors change, if this becomes a little bit of a learning experience for the market, a new entrant down the road might be better received." The number of passengers traveling to and from Deer Lake Airport (YDF) in June reached 28,486 and represents a 38% increase over June of 2006. Nearly 8,000 more passengers traveled through the airport in June of this year (2007) as compared to June 2006. Astraeus Airlines will not offer flights from St. John's to England during the fall and winter, the airline told travel agents in a release Thursday. The London, England-based charter airline had intended to replace the year-round flights from St. John's to London that were cancelled by Air Canada nearly a year ago. In Thursday's release, the airline said there was not enough demand to support the year-round service. Air Canada gave a similar reason when it cancelled the service. Astraeus will cancel its Sunday and Thursday flights at the end of August. The last flight of the year from St. John's will depart on Sept. 18. Customers with tickets for the cancelled flights will receive refunds.